January was a busy month for me, what with end of semester tasks to complete; there were exams to mark, final marks to calculate, and report card comments to write. 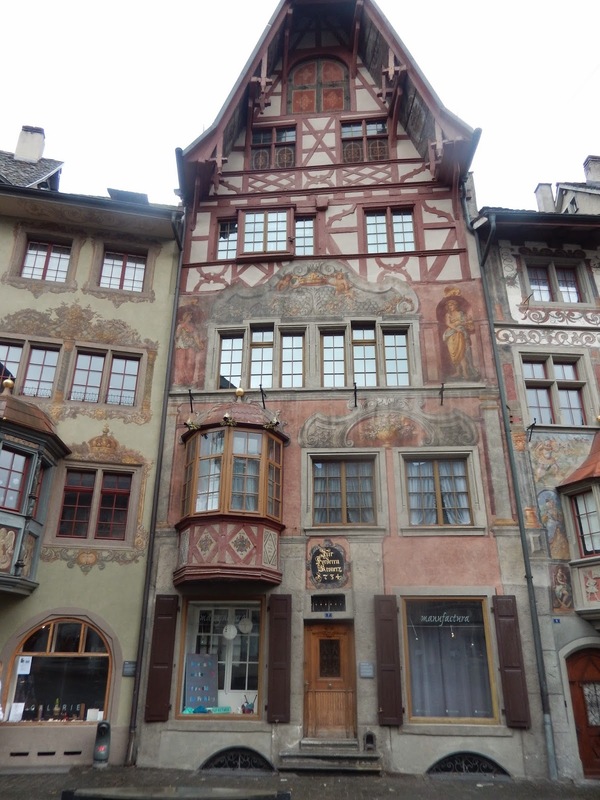 Still, I managed two trips outside of Neuchâtel before the mid-semester break began. In both cases, Dan suggested the destinations and offered to drive, while his colleagues, myself included, were happy to tag along. 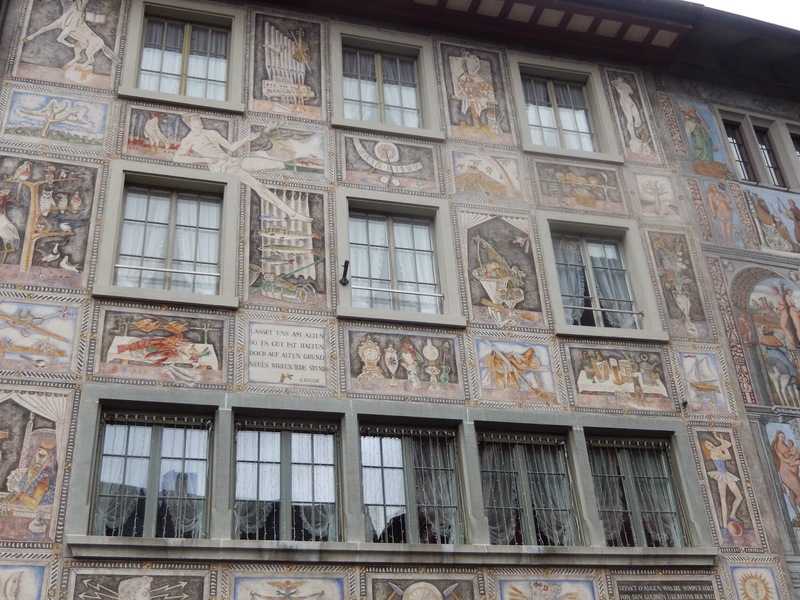 On January 11th, Dan suggested a day trip to Stein am Rhein. 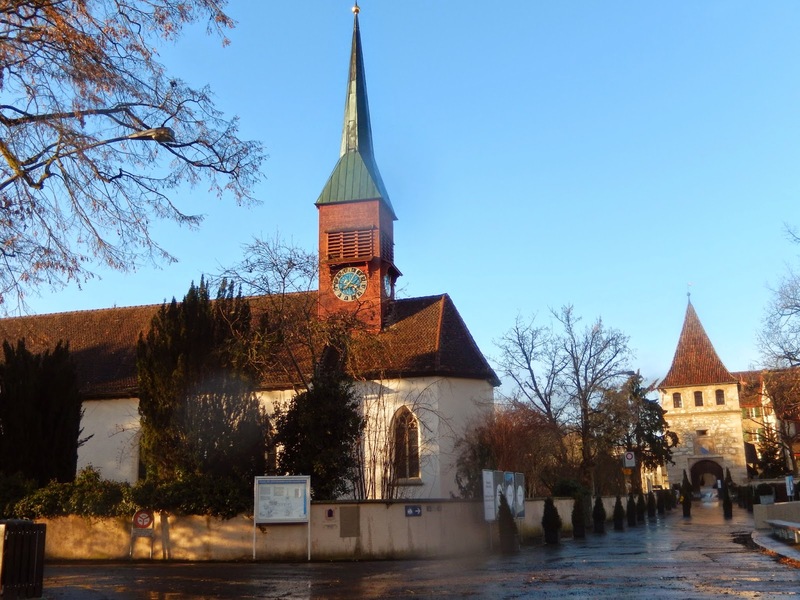 This small town north of Zurich registered with me since my son had visited it about 6 years ago and had commented on its beauty. Jen and I hopped into Dan’s car after breakfast. The journey took about two and a half hours, so that we arrive at our destination just in time for lunch. On this day, the weather was not always cooperative; we had a little of everything from rain and snow to bright sunshine mid-day but the trip was well worth taking nonetheless. Stein am Rhein means “Rock on the Rhine”, by the way, but there is nothing rocky about the place. 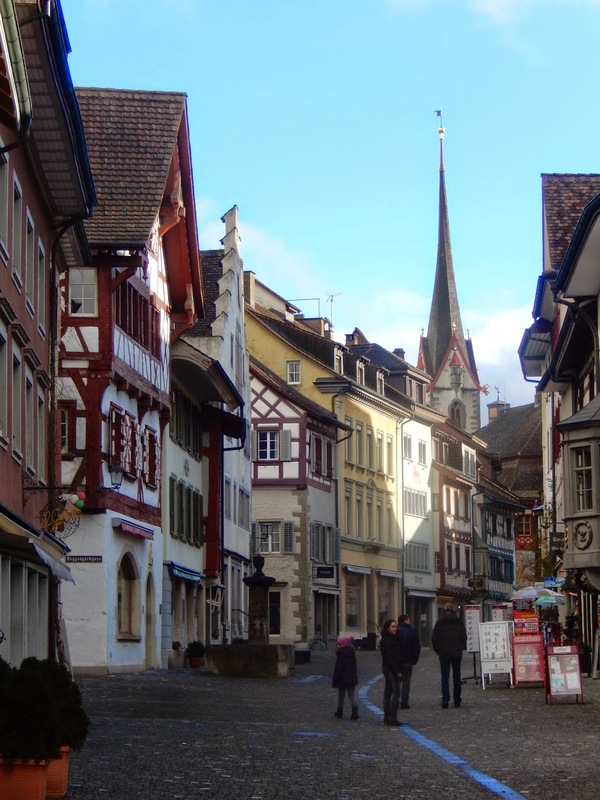 The town is like a picture postcard with its colourfully painted half-timbered buildings. On this chilly Sunday, it was pretty much deserted. There were a couple of die-hard merchants open for tourists so we did our best to support them, but mainly we meandered along the main street and took our time enjoying the town’s unique character. 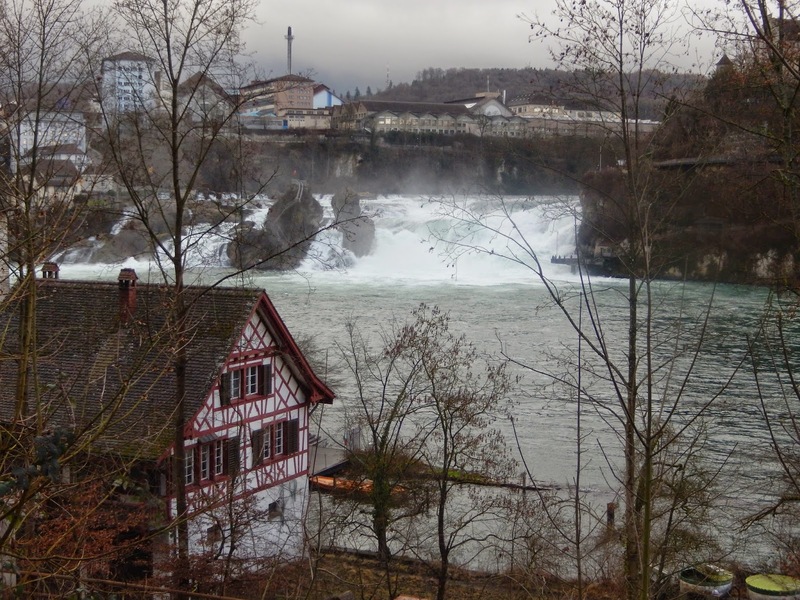 Heading west, we followed the Rhine River until we arrived at Schaffhausen, near the famous Rheinfall. We decided to view this impressive sight from two vantage points. Pulling over to the side of the road, we were able to get a clear view from above, but when we made our way to a tourist parking lot for an even closer view, the weather turned so ugly – raining sideways – we decided to return to the comfort of the car. Of course, as soon as we did that, the sun came out and I got one last gorgeous shot of the church and gate before we headed home. Just a few minutes before I took this shot, it had been very windy and rainy. The following weekend, Dan, Paul and Jen convinced me to join them for an overnight trip to the French Alps. (Usually, I do not need much arm-twisting to travel but on this weekend I had my exams to mark.) Our destination was Grenoble, famous for hosting the 1968 Winter Olympics. Again, the January weather made conditions far from ideal some of the time. Emerging from a tunnel just south of the French border crossing, we found ourselves very suddenly in a blizzard. That was a shock! I suppose this should have been no surprise since we were climbing to higher elevations as we traveled. Fortunately, Dan is a very good driver and we made it to our destination with no difficulty. 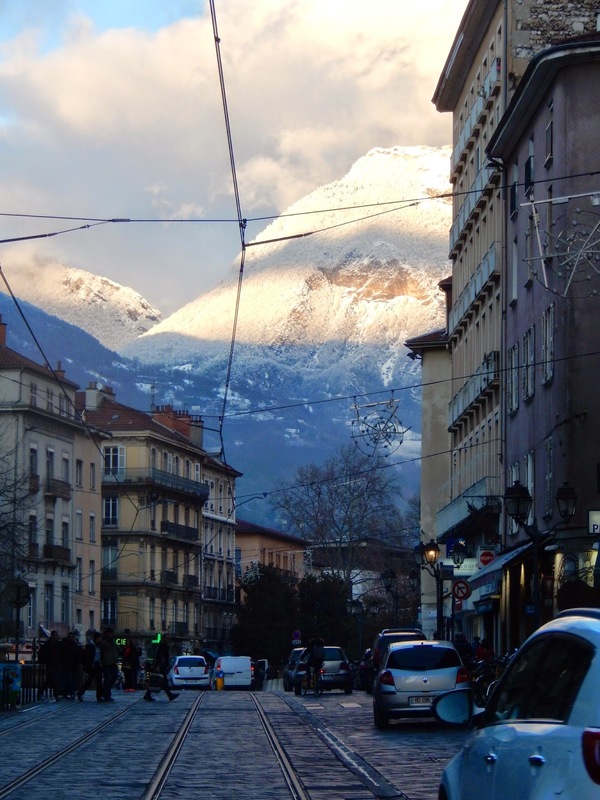 The mountains looming over Grenoble. 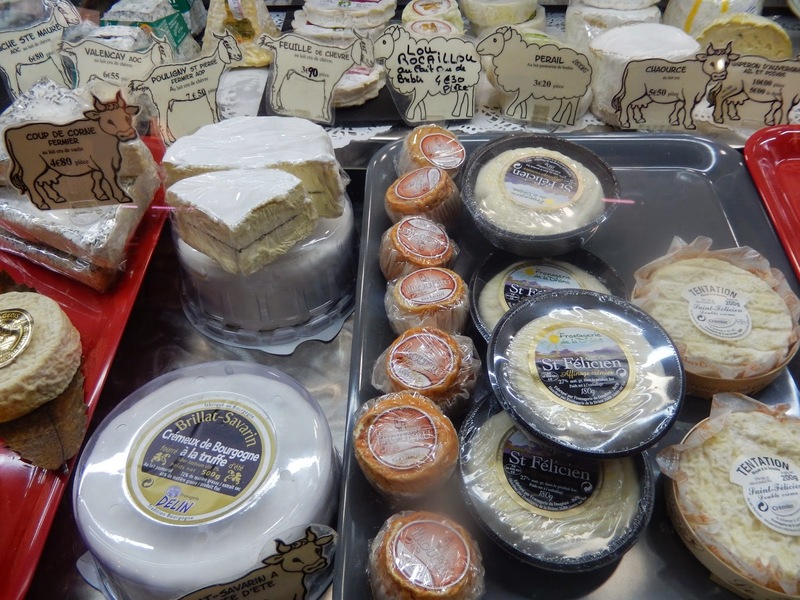 Local cheese at the Saturday market. 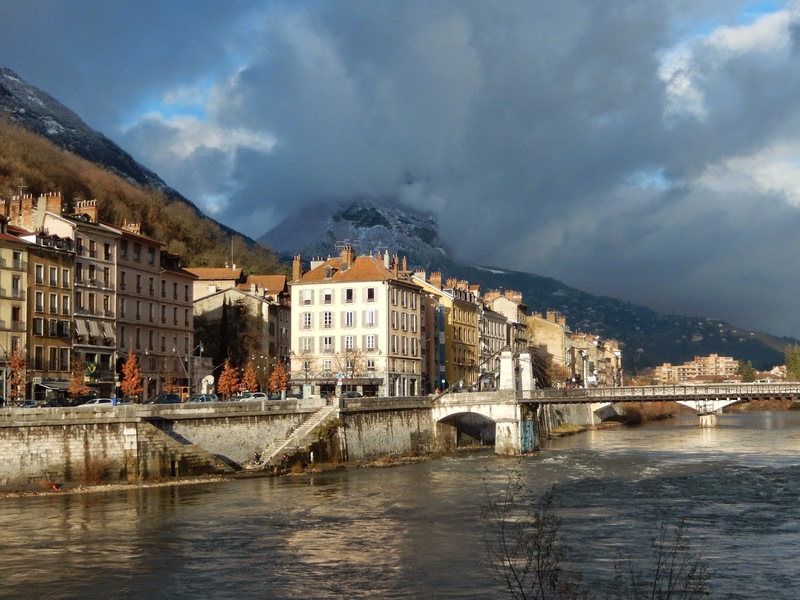 Grenoble is an impressive city of 150 000 which is surrounded by mountains. Its Saturday market was a great way to begin our explorations. 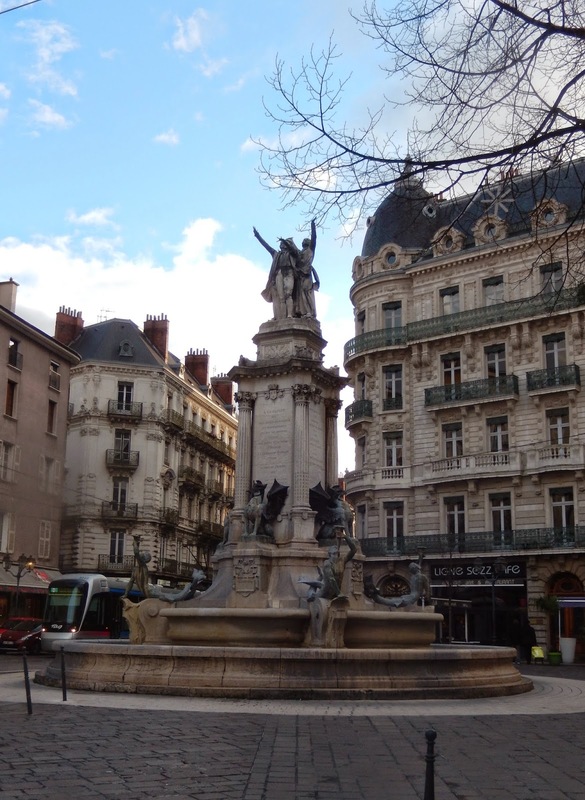 As we walked through the pedestrian area of the city, we discovered that Stendhal, a 19th century French writer, was born here, and that civic unrest in 1788 near the former Hôtel de Ville was a precursor to the French Revolution. It was called The Day of the Tiles. One serendipitous moment occurred when we entered Eglise Collégiale St-André as mezzo-soprano, Dominique Dumas, was rehearsing for a concert the next day. Her voice was splendid, so much so that we did not want to leave the building, and when she finished one piece, we all burst into applause. Another special part of our day in Grenoble was our dinner at La Girole, an outstanding restaurant. Dan was thrilled that the wine list included two of his favourite reds, but I particularly loved the meal we were served and the presentation. The French certainly know how to prepare and serve food! 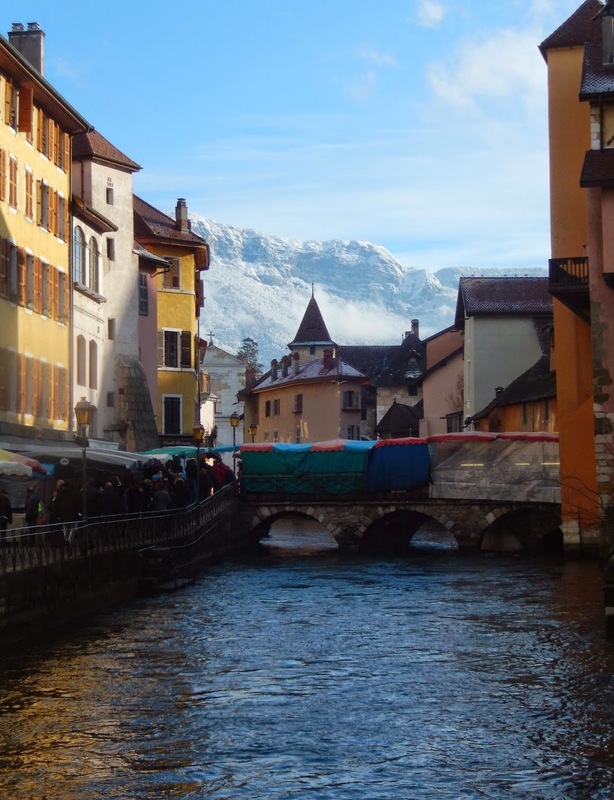 In the morning, we headed back toward Switzerland by way of Annecy, a return trip for me to this gorgeous town of canals. We were fortunate to stumble upon a Sunday market which livened up the place. We also really enjoyed our lunch. I sampled the local specialty, a tartiflette – in our waiter’s view, the Annecy version of poutine. 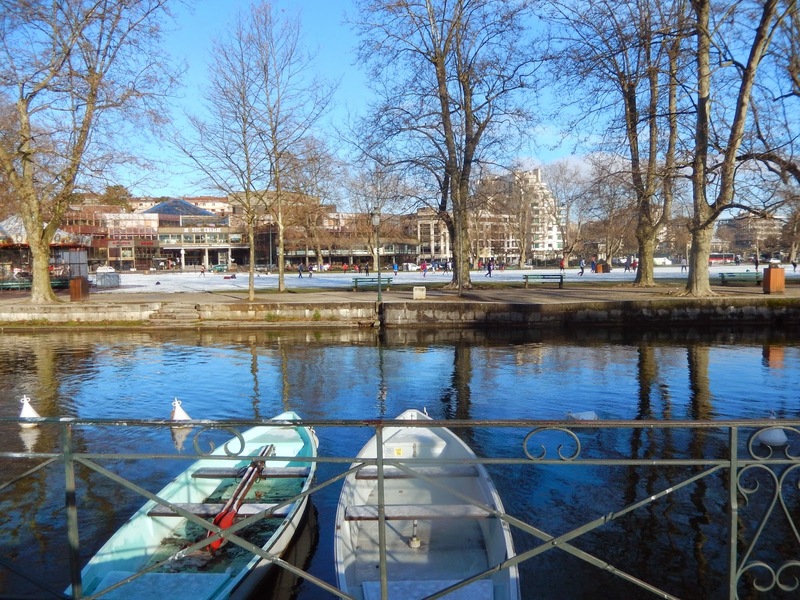 Annecy is just as lovely in summer and as it is in winter. 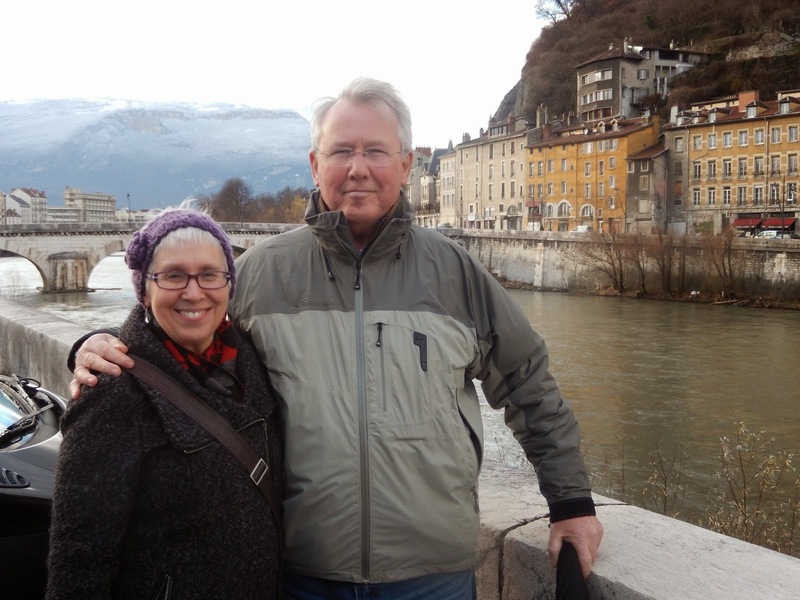 I was particularly pleased that Jen and Paul were able to see the place, just as Bob, Terry and I had in August – clearly, it is one of Dan's favourite escapes. (There is a blog post about Annecy from late August so if you would like to know more about Annecy, you can have a look back at that entry.) With Paul headed back to Canada at the end of January, this would be his last trip with us. A gentle man and a gentleman, we will miss Paul Duckett. Photo taken in Grenoble. 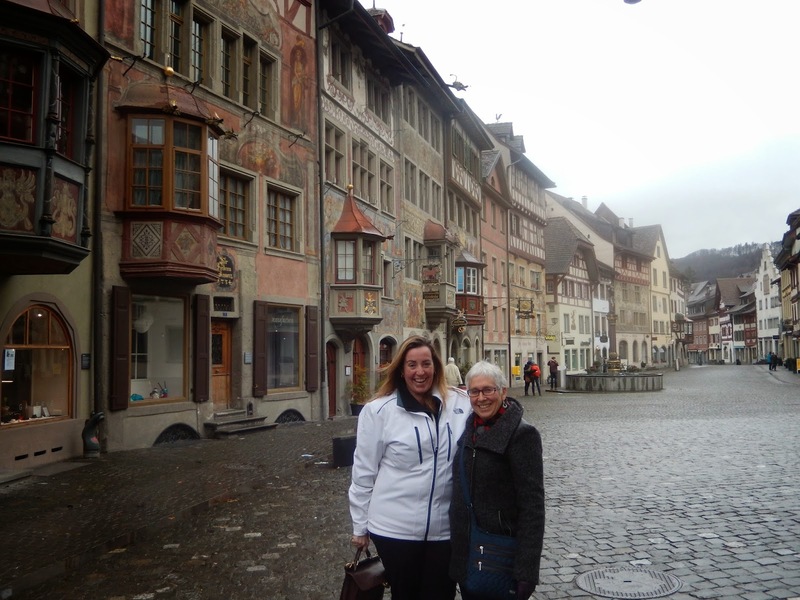 By late afternoon, we were back in Neuchâtel, thankful again that Dan was so eager to travel to so many places in Europe. We were all grateful for his generosity. I my case, I tackled those exams with renewed vigour. A little play makes the work much easier to bear.